Despite my busy schedule this week the goings on in Iowa did not escape me. It's exciting! For the first time in decades we have an embarrassment of riches among the Democratic candidates. And more than that, Iowans turned out to caucus for Democrats over Republicans two to one. 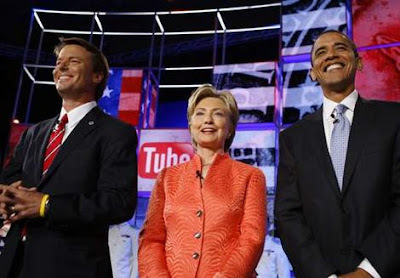 Quite surprisingly (or not, depending on your perspective) Barack Obama walked away with a comfortable lead among the Democratic contenders and in an upset of quiet victory Edwards came in second over much touted one-time front runner Hillary Clinton. This has set off an email exchange in our family of mostly Obama and Edwards supporters as to who the best candidate is. (No one seems to be all that enthusiastic about Hillary, but if she got the nomination everyone of us would vote for her.) My brother (who has his 3 year-old son chanting "O-BAMA" in the car on the way to pre-school) and mother are staunch members of the "coalition for change" in support of Barack's visionary hope for the future citing his victory speech the other night as one of the most inspirational since Bobby Kennedy. As for the argument that he is all rhetoric and no substance, they point to his book "The Audacity of Hope" which outlines his positions on all the major political issues of the day. The funny thing about our family is despite our debating, we're all essentially on the same side. One friend who spent a Thanksgiving dinner with us during which a heated political discussion ensued noted "they all argue with each other but they all agree on everything!" So where do I stand among the three Democratic hopefuls? Undecided. Truth be told I'm probably leaning more toward Edwards at this point, (and mourn the loss of Biden from the race whom I have always admired) but find much about Obama promising and admirable. As for Hillary, I love my senator and would be proud if she became our president, but there is something about her that makes me think she'd sell me down the river the first chance she got if it was politically advantageous to her. I don't know--maybe it's "Don't ask, don't tell" that's left a bad taste in my mouth. But the difference this year is that I'm trying to decide on the best of three extremely smart, qualified, electable candidates rather than the lesser of all evils. Can't wait to see what happens in New Hampshire. "But the difference this year is that I'm trying to decide on the best of three extremely smart, qualified, electable candidates rather than the lesser of all evils." This was my first year attending the Iowa caucus along with a lot of people. I was undecided, leaning toward Hillary up until the last two days. I guess what turned me was the fact that there is so much dislike of her from the other side. I would be happy with any of the candidates. I just decided that Obama was a breath of fresh air. wow! i am SO envious of your family! i love my own, but how i ever grew up in such a hotbed of conservativism is beyond me. even the young ones . . . so distressing. For the first time in decades we have an embarrassment of riches among the Democratic candidates. And more than that, Iowans turned out to caucus for Democrats over Republicans two to one. it is an embarrassment of riches and so divine. i watched the rethug debate last night on CNN. what a bunch of idiots. over an hour of yapping and they didn't once discuss the worsening situation of the middle class, our insane job losses, the skyrocketing cost of food. none of that. rich white motherfucking bastards. i just wanted to ~ actually i did ~ scream at the television. they are so wholly out of touch with the american people, it is sickening. and it enrages me that they have sucked into the rethug party various interest groups. the reality of that party is that it is for rich americans. really rich americans. and they've used immigration and hatred of gays and abortion and such to lure average joes and josephines into voting for them, which is a vote against self interest in the main. i am also an edwards gal. he has that fighting spirit i love. i fear it is his anti-corporate message, though, that has caused the media to ignore him. he's just the kind of candidate we need. i doubt he'll continue in the race much past SC, but maybe . . .
hillary would be fine, too. but i'm really inspired by the fact that lily white iowa voted for obama. and by the huge turnout among the dems. if we can just keep from shooting ourselves in the foot, maybe we'll win this one. keeping my fingers crossed on that. we have to have a dem president for real ~ not allow them to steal it again as they have the past two elections. an embarrassment of riches ~ yes!! yes, it is a lovely family background, as one of Michael's sisters for Edwards - we are lucky! bigassbelle-- you would fit in very nicely in our family!! I've been undecided but definitely leaning heavily toward Obama. It is is so nice to have three great options -- even more than that before folks started dropping out. I liked Richardson and Biden too. A New York resident for 17 years. Actor, singer, florist--you fill in the blanks.